45-metre-long underg­round passag­e discov­ered from a house in Ghausi­a Colony. Paramilitary Rangers claim to have thwarted a terrorists’ bid to tunnel into the main prison of the metropolitan city and stage a jailbreak that could have freed up to 100 dangerous militants from outlawed groups. The attempt was reminiscent of the daring breakout in April 2011 when the Afghan Taliban had tunneled at least 480 inmates out of the main prison in Kandahar province of Afghanistan, whisking them through a 1,000-foot-long underground passage they had dug over months. On this side of the border, the Pakistani Taliban had freed nearly 600 inmates – among them some high-profile Taliban fighters – in near-identical raids on Bannu and DI Khan prisons in 2012 and 2013, respectively. Col Tahir Mehmood of Sindh Rangers said that the 45-metre-long tunnel was discovered three days ago during an intelligence-led raid by Rangers personnel in Ghausia Colony, located on the back side of the Central Jail, Karachi. The ground-plus-one-storey house was purchased by terrorists a year ago but they started digging the underground passage – five feet high and three feet wide – some two months back, sources told The Express Tribune. “Nearly 45-metre tunnel had already been dug from an underground water tank at the house towards a dry well inside the jail boundary, and was just 10 metres short of its target when the Rangers conducted the raid based on information provided by intelligence agencies,” Col Tahir told a news conference at the Rangers headquarters. He added that they also detained terrorists from the house but did not name them or say how many. Sources, however, said that three to four terrorists were taken into custody from the premises. Col Tahir claimed that they have also made more arrests from other parts of the city on the basis of information gleaned from the detained terrorists. 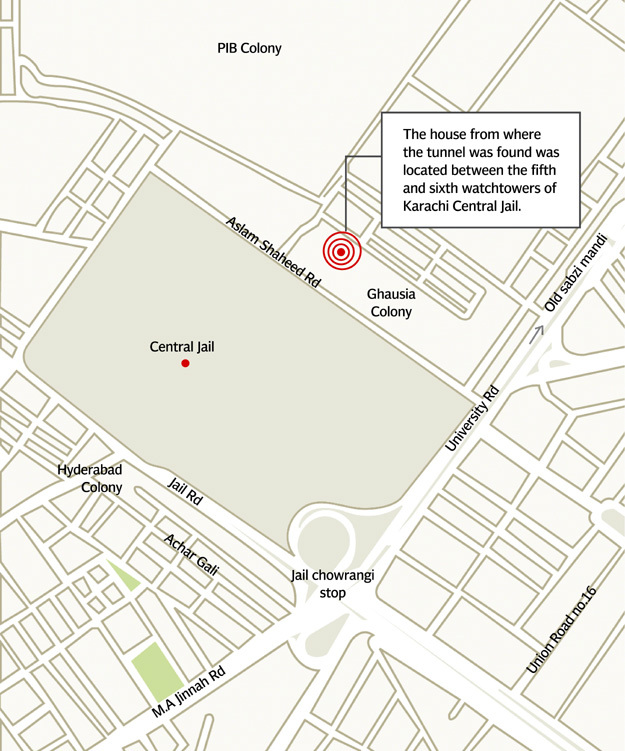 The aging, overcrowded Karachi prison houses over 5,500 inmates – including around 100 terrorists from groups like Haqqani Network of the Afghan Taliban, Tehreek-e-Taliban Pakistan, Lashkar-e-Jhangvi, Sipah-e-Sahaba and Jundullah. Nearly 100 dangerous terrorists were present in the cells near the well where the suspects wanted to enter through the tunnel, sources added. Sources said that members of four banned outfits were involved in the daring plot. “They were planning a major terrorist attack before the month of Muharram to divert the attention of the law enforcers and then take advantage and stage a jailbreak,” one source explained. Interestingly, there is a heavy deployment of Rangers, police and jail staffers in the area where they have set up watchtowers and pickets atop nearby buildings, while jammers are also installed in the vicinity. The house is located between watchtowers of the jail police atop the boundary wall and pickets of district police on the rooftops of the buildings adjacent to the jail. The provincial minister for prisons, Manzoor Wassan, told the media that the house belongs to a police constable and six policemen had been deployed atop its roof. He added that an inquiry has been ordered, led by Home Secretary Dr Niaz Ali Abbasi. 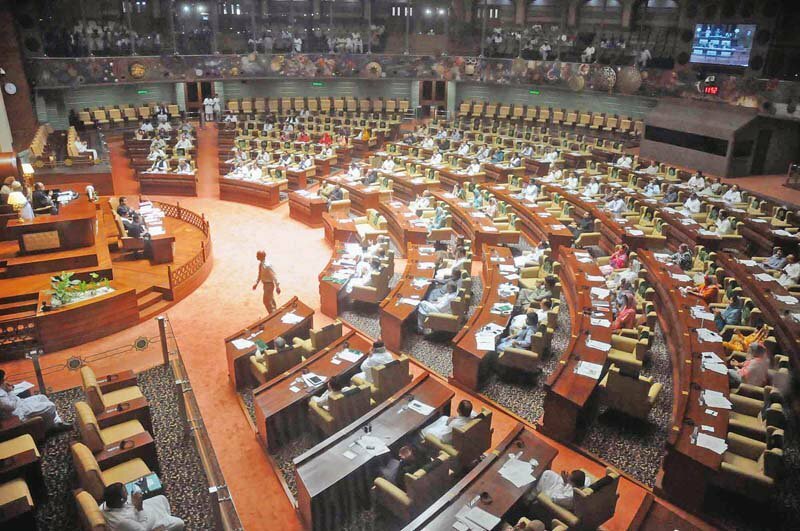 The inquiry committee, comprising officials from Rangers, district police, jail police and intelligence agencies, will submit its report to the chief minister within a week. The area police disputed Wassan’s claims. “Neither any police picket was set up at the house nor does the house belong to any policeman,” a senior officer of the District East police told The Express Tribune. He sought to pass the buck, saying that it was a responsibility of intelligence agencies to trace such activities. Ghausia Colony, which has a population of one million, escaped the attention of law enforcers during the year-long targeted operation in Karachi. Also, the neighbourhood didn’t come under the radar even after the deadly attacks on senior police officers SP Chaudhry Aslam Khan and Inspector Shafiq Tanoli as well as grenade attacks on the prison and repeated warnings of a possible jailbreak from intelligence agencies. Bangash said the suspects belonged to a militant outfit and intended to carry out a sabotage plot in Hangu Bazaar.